Neighbors in a Florida neighborhood couldn't believe that random strangers were lining up on their street in the middle of the night for some beer. This past week, Angry Chair Brewing in Seminole Heights, Florida was been participating in Tampa Bay Beer Week and released a special $35 barrel-aged Imperial German Chocolate Cupcake Stout for the event. For the past few days, neighbors have told Scripps station WFTS in Tampa that people began lining up in the middle of the night to guarantee they’d get their hands on a bottle. 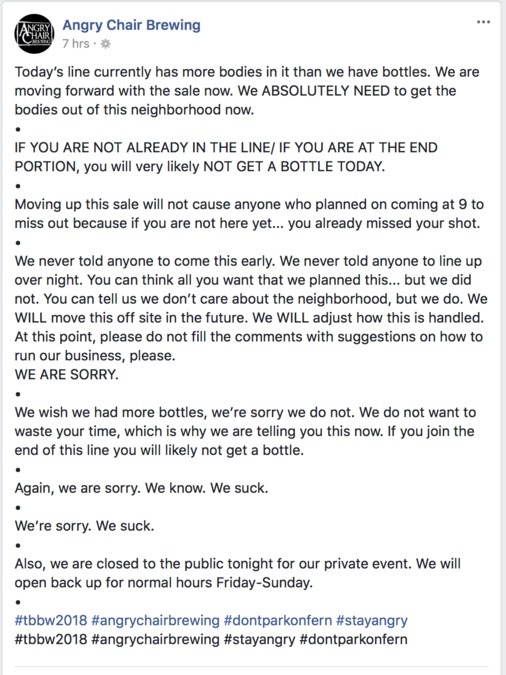 Dowdle said that he didn’t expect this type of response during Beer Week. He said he’s trying to make it right, even promising next year’s beer distribution event will be moved to an off site location. The residential streets near Angry Chair Brewing have limited parking as it is – so add in the influx of beer lovers, and it was a mess, according to neighbors. One person snapped a picture of a garbage truck trying to squeeze through. Dowdle says he had signs made up for neighbors to put in their yards that said 'no parking here' to try and discourage the beer lovers from parking outside the homes. Cat Tyler lives in the neighborhood, and said people were lined up for blocks, up and down the alleyway. 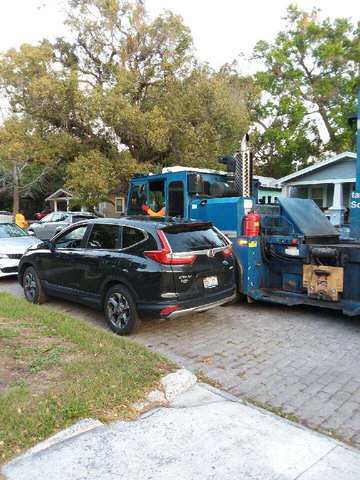 Some even complained how driveways for homeowners were completely blocked. Tyler said she’s glad to see the business thriving, and wants them to stay.